Tribute 1 Insect monster from either field equipped with an Equip Card, and if you do, Special Summon 1 Insect monster from your Deck, ignoring its Summoning conditions. During your Main Phase: You can banish this card from your GY, then target 1 Insect monster in your GY; shuffle it into the Deck, then draw 1 card. You can only use this effect of “Cocoon of Ultra Evolution” once per turn. Cocoon of Ultra Evolution is a QuickPlay Spell Card that lets you tribute an Insect monster with an Equip Card from either side of the field to Special Summon any Insect from your deck. That’s cool to bring out Insect monsters. The versatility lies within the second effect. You can Banish Cocoon of Ultra Evolution from the grave during your Main Phase to shuffle an Insect in the grave back into the deck and draw one card. This second effect is a hard once per turn and it targets the shuffled insect, but it only takes a few good insect monsters to make this playable in other decks. Since it ignores summoning conditions, all future boss insect monsters become playable. Very good support for an under supported type. For people that really wanted to use Cocoon of Evolution with Petit Moth to summon Perfectly Ultimate Great Moth, you now have an easier way to summon that piece of perfection… well it isn’t really perfect but you get what I am getting at. For you bug lovers, here is Cocoon of Ultra Evolution. 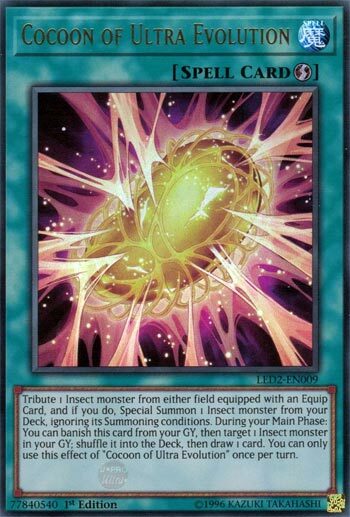 Cocoon of Ultra Evolution is a Quick-Play Spell that lets you tribute an Insect monster equipped with a card to summon any Insect from the deck ignoring the summoning conditions. The first card to come to mind to summon with this is the new Insect Queen that is actually quite good, but as I mentioned before you can go for Perfectly Ultimate Great Moth with this, though all you get with that is a 3500 ATK vanilla basically. A deck this could be useful in is Inzektors as they love to equip themselves with other Inzektor monsters. You can also use this with the new Parasite since it treats the monster equipped as Insect. Just know you can tribute a monster your opponent has, so that would be optimal if you can do that. While in the GY, you can banish it to shuffle an Insect into the deck and draw a card, and this is a hard once per turn. Nice little recycling, especially since Inzektors still have only one Dragonfly still, Hornet is still limited as well but you want that in the GY. Overall, this is a nice card for Insects, play it if you have equips in your deck, though I am sure most Insect decks might tech the new Parasite now, so this is more optimal. Art: 3.5/5 Better than the original Cocoon of Evolution. Cocoon of Ultra Evolution IS better than its non Ultra counterpart. It benefits immediately from being a Quickplay and the fact that the Monster required can be on either side of the Field. The thing that hurts this card most in my eyes is that it’s a -2. You have to give up this card, plus a Monster, and that Monster has to have its own card equipped to it just to satisfy the condition for this card. This helps a Deck playing Perfectly Ultimate Great Moth, for one, and it can help with others, but it cost too much to not get enough back. But there’s more, during your Main Phase, you can remove this card from play, to shuffle an Insect back into your Deck, (said Insect comes from your Graveyard) and you Draw one card. This, at least unlike the first effect, is a 1-for-1. Plus you get a Monster back, and recycling a resource is usually a good thing. The card is more playable for the latter than the beginning, but that’s just me. Rating: 3.25/5 Some Insect Decks will use it, some won’t.